MILE-HI TRUCK TRANSMISSIONS, INC. is a family owned and operated business that has been providing top quality truck repair services and parts sales since 1969. With over 145 years of combined knowledge and experience, MILE-HI TRUCK TRANSMISSIONS, INC. has a reputation throughout the United States of providing quality, fast service. Our philosophy is to do it right the first time, because we understand that downtime is money to our valuable customers. If you want the correct diagnosis and the right parts repaired the first time, then MILE-HI TRUCK TRANSMISSIONS, INC. is the heavy duty and medium duty truck repair shop for you. Our services include heavy duty and medium duty truck clutches, transmissions, differentials, wheel seals, drive line angle diagnostics and modifications, drive line vibrations, fly wheel machining, PTO's and setups and more. 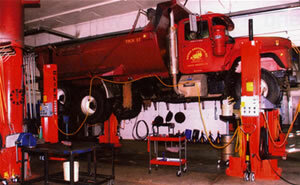 Contact us to schedule a service appointment or to confirm our shop hours. We offer full units for sale or individual parts. We have the knowledge and experience to properly diagnose and choose the right part the first time. Our product line card includes Dana, Eaton, Fuller/Roadranger, Spicer, Meritor, TTC, Fabco, PAI, Chicago Rawhide, Clark, Muncie, Chelsea. We service Mack, Kenworth, Ford, GMC, Peterbuilt, Freightliner, Western Star, Volvo, & International heavy and medium duty trucks and more. Copyright © Mile-Hi Truck Transmissions, Inc. All Rights Reserved. Refer to Legal Restrictions. All trademarks, product names, company names, graphics, and logos appearing on this site are the property of their respective owners.